Did You Say Tricolored Heron?! 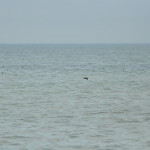 This morning I headed out to Point Pelee like I’ve been doing for the past few Saturday mornings. I tried to get to the park for sunrise but missed it by a few minutes. 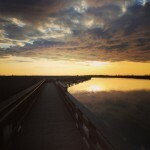 It was beautiful over the marsh this morning. I met Jeremy Hatt at the tip parking lot and we scanned the ducks off to the west and picked out some Surf Scoters, a bird I still needed for the year. Nice start to the day. We eventually made our way down to the tip where we were joined a little while later by Richard Carr. He was telling us about an Eared Grebe that Alan Wormington had picked out the day before at the tip. 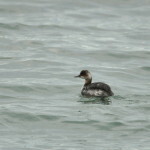 Just after he finished the story, I went back to scanning and almost immediately picked out an interesting grebe. It was an Eared! 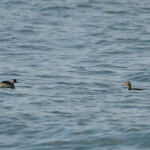 Eared Grebes are uncommon but seem to be pretty regular migrants at Pelee. After scanning the ducks at the tip, we headed north to check out the land birds. We added a few more birds to our day and year lists (yes we’re listers – it’s fun!). 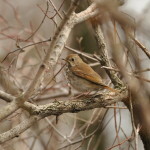 Some of the new additions included a very obliging Blue-gray Gnatcatcher, Brown Thrasher and a few others. Our last trail for the day was Woodland Nature Trail where we hoped to come across a Louisiana Waterthrush. We checked all of the sloughs and finally on the last one, a L. Waterthrush made a brief appearance. 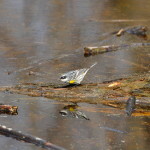 After watching many Yellow-rumped warblers working the slough, we headed off back to the Visitor Centre and our cars. I headed home for lunch. After lunch, I got a text from Jeremy Bensette and Jeremy Hatt, an email from Alan Wormington, and an Ontbirds post about a Tricolored Heron that Jeremy Bensette had just spotted flying toward the Sturgeon Creek area. This was a very ‘wanted’ bird for me. I mentioned it to Sarah and she said “Let’s go!” We packed a few snacks for Emily and the three of us jumped in the car. 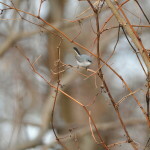 I got a few updates that the bird had been spotted again in flight so I was hopeful that we would get it. The plan was to check out Sturgeon Creek so we pulled into the marina and I started scanning the marsh. I spotted what I thought was a small blue heron-looking bird at the back of the marsh but everyone thought the bird was still out near the lake so I didn’t really think much of it. I started scanning out toward the lake and didn’t see anything but something clicked in my brain that I should turn around and check that bird again. I sure am glad I did – It WAS the Tricolored Heron! We tried to get everyone on the bird but just as Sarah was about to look through the scope, the bird flushed back and out of sight. We waited a while but unfortunately it didn’t pop back out. Sarah has seen many of them on our trips to Florida but I still felt bad that she didn’t get on it in time. I guess we’ll just have to find another one here!